Rabbi Yossi Shuchat, C.M. 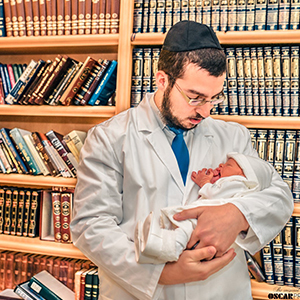 is a certified Mohel trained by expert Mohels in the medical and Rabbinical field, in New York, Israel, and London. He received certification from the internationally renowned London School of Circumcision. Known for his warm and caring personality, he is committed to providing a sense of confidence and calm to anxious first-time parents. He performs the circumcision in a quick, natural way with minimal pain. Follow up calls and proactive check-ins before and after the procedure are the norm. With meticulous attention to fine detail and deft skill; parents, pediatricians, doctors and urologists often mention how excellent the outcome is, and are quick to refer him. He is fluent in English, Spanish, French and Hebrew. In addition, he is highly regarded for the circumcision ceremony itself. He adds meaning and significance to the ceremony, ensuring an enjoyable experience for all. Rabbi Yossi Shuchat resides in Las Vegas with his wife and children. He serves as the Rabbi and director of Or Bamidbar – Chabad Las Vegas. Additionally he gives lectures to doctors and is affiliated with Sunrise Hospital and Sunrise Children’s Hospital. Member of the American Board of Ritual Circumcision and the International Bris Association.